The kind folks over at Destination Thailand and Travel Asia and Beyond invited me to host a couple of their television shows recently. It was quite an experience. If you've never seen yourself of television before, it can really come as quite a shock - especially when you totally ad-libbed all of it and you should have had a proper haircut. Still, I'd do it again in a second. I have no pride. 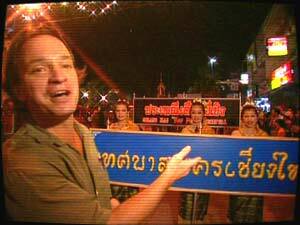 A still from the Loi Kratong episode. Loi Kratong is a holiday that takes place in November all over Thailand. I wrote a slightly-exaggerated article for a local magazine about hosting this, my first TV show. Poi Sang Long takes place in March or April in Mae Hong Son province, near the Burmese border. I wrote the narration script. Everything else I improvised, however inexpertly.